Cause of his death was stroke. Another name for Frank was "Dox." • He appeared in the 1898 city directory living at 1563 West Monroe Street in Chicago, Cook County, Illinois. • He appeared in the 1900 city directory living at 1563 West Monroe Street in Chicago, Cook County, Illinois. • He appeared on the census in 1900 at 1563 West Monroe Street in Chicago, Cook County, Illinois. • He appeared on the census in 1910 at 3406 West Monroe Street in Chicago, Cook County, Illinois. 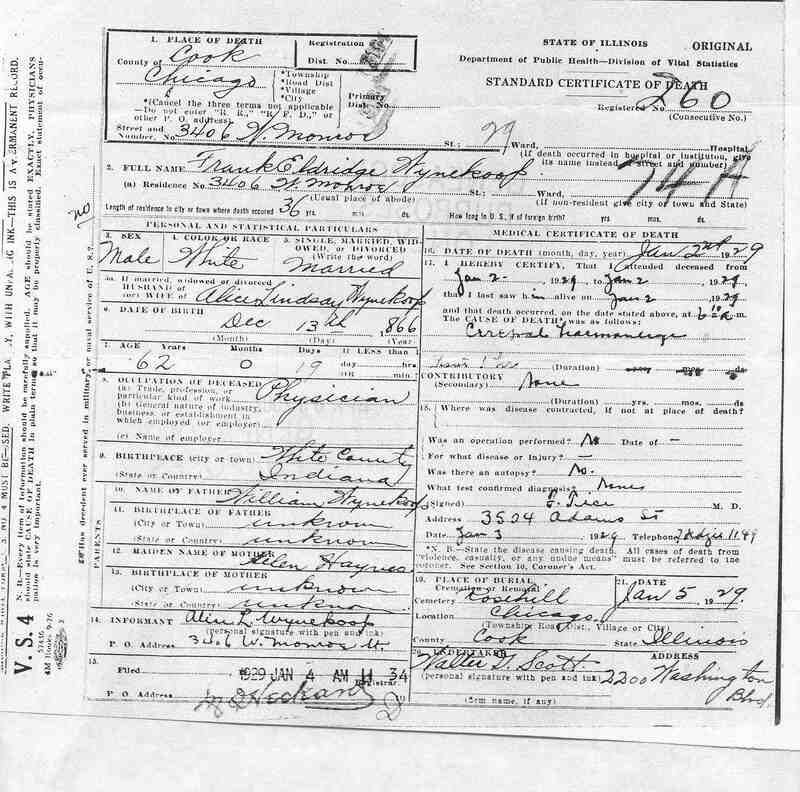 • He appeared on the census in 1920 at 3406 West Monroe Street in Chicago, Cook County, Illinois. He was head of household and property owner. • He worked as a medical doctor. • His funeral was held Walter Scott (2200 Washington Blvd.) in Chicago, Cook County, Illinois. • He was buried at Rosehill Cemetery in Chicago, Cook County, Illinois. 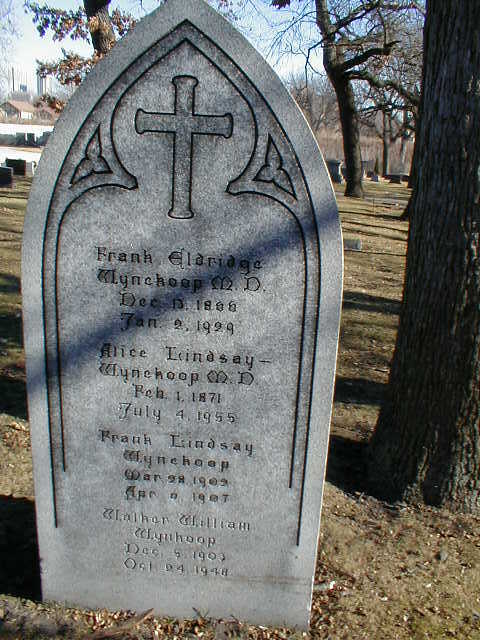 Frank married Alice Lois Lindsay, daughter of Benjamin Franklin Lindsay and Catherine Frances Wiswell, 17 April 1900 in Onarga, Iroquois County, Illinois.124 (Alice Lois Lindsay was born 1 February 1871 in Onarga, Iroquois County, Illinois,125 died 4 July 1955 in Chicago, Cook County, Illinois 125 and was cremated 6 July 1955 in Chicago, Cook County, Illinois at Mt. Hope Cemetery 126.) The cause of her death was pneumonia.